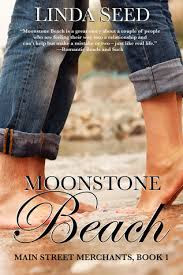 Moonstone Beach is the first book in the Main Street Merchants series as well as the debut novel for author Linda Seed. This was well constructed book and really shows the vast potential that Linda has to offer. The dual point of view type of writing was a good choice as it let you get into the mind of both the main characters. I personally found Kate's character annoying because she was able to only stand up to Jackson and no one else, she always let her father walk all over her which had me screaming at her many times. Jackson's character was very plain, other than the fact that he was a chef there was nothing different about him which made him in turn very boring. The chemistry between Kate and Jackson was simple most of the time and there were not much explosive or wow moments. I also felt that the book ended very weirdly because after the last chapter it just felt incomplete. This is an average book from an author who has tremendous potential and I hope the series becomes more interesting as it proceeds. Kate Bennet is a book store owner in the small tourist town of Cambria and two years after her divorce she finally thinks she is ready to get back into the dating pool again. Jackson Graham is a hot chef with a fiery temper, who loves to control everything when it comes to food, but it careless when it comes to women. Kate's friends end up setting her up with Jackson and Kate expects it to be a fling filled with pleasure, but Jackson has had a crush on Kate for years and he is in it this time to win. The only problem is that nor Kate or Jackson knows if Jackson can change his self defeating habits which usually send women running out the door.